I am looking to apply conditional formatting to all the cells in my sheet and highlight cells that contain a formula. I know that I can format cells based on a custom formula, and I know that I can use the ISFORMULA() function to determine a cell contains a formula. e.g. I can apply conditional formatting to cell B7 using the custom formula =ISFORMULA(B7). How do I format an entire range using this formula? I do not wish to manually type this formula for every cell. You can use a range as a parameter for the ISFORMULA() function. e.g. 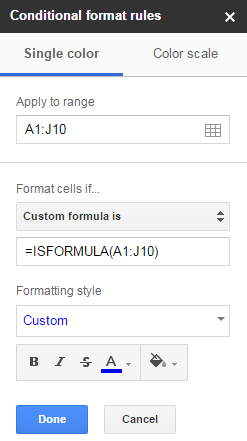 If you want to highlight all cells containing formulas in the range A1:J10, then you can use the formula =ISFORMULA(A1:J10) and apply it to the range A1:J10. Note that this works with normal ranges (e.g. B2:F30), but not with infinite ranges (e.g. B:F).